Suffering from a case of sickly shoulders? Turn an ordinary shoulder workout into a monster mass maker with these 6 steps! Just about every shoulder training article online contains some variation of the following advice: "Start with an overhead press, and then do single-joint movements for each deltoid head." Yes, this is solid advice, but if that's all it takes to build monster shoulders, then there should be a lot more people walking around with scary-big delts! The truth is that this solution will only get you so far. After you've been training for a few years, your delts have probably adapted to the standard formula. At the advanced stage, you need to incorporate enough changes into your workout to reignite overload without abandoning the volume, intensity, and rest variables that have already been proven to work. 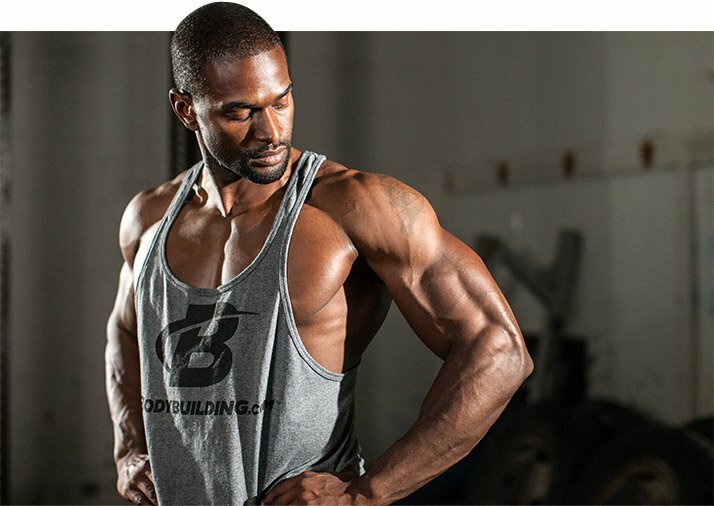 If you're ready to build seriously big and strong delts, I'll show you how to turn a basic nuts-and-bolts shoulder workout into an advanced session, complete with recommendations for each exercise to make a truly monster routine. I imagine this mass workout will become your new standard on shoulder day. Read all the exercise and training tips, grab the workout, and go crush your next shoulder session! Remember the advice I mentioned earlier? It's still a good place to start, even when you're retooling your routine. Why? It's best to begin your workout with a multijoint exercise because multijoint moves enlist the greatest amount of muscle mass, thereby allowing you to lift heavier weights. So, start your shoulder session with an overhead press. There are several press variations to choose from. What makes these movements different from one another is the type of equipment you choose, as well as where your upper arm travels relative to your torso as you lower the weight. On the latter point, during some overhead presses like the dumbbell version or behind-the-head barbell press, your upper arms come directly out to your sides as you lower the weight. 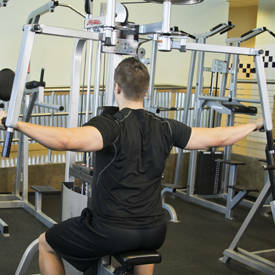 This is a sure sign that your middle delt is primarily targeted during the motion. With this monster workout you'll do two multi-joint exercises to start. The dumbbell version engages the middle delts more strongly, while the barbell to the front of the head emphasizes both the front and middle heads. When your elbows instead pull somewhat forward, as when doing barbell presses in front of your head, you emphasize both the front and middle delts. 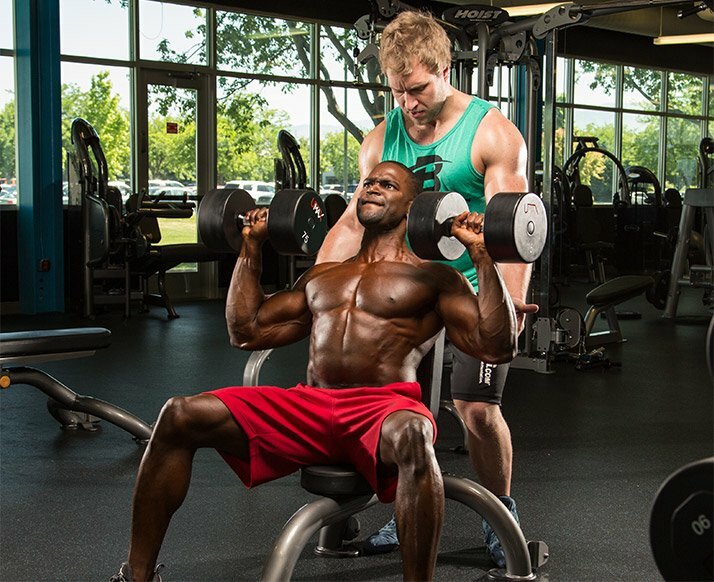 Now you can use this information to determine which delt heads a particular machine emphasizes. Machine overhead presses differ by manufacturer, so keep an eye on the direction of your upper arms as you lower the weight, which will help you easily identify whether you're getting much contribution from the front delt. To focus on the front and middle heads, start this monster workout with the seated barbell press to the front of the head. Because the first movement is the one in which you're typically going to challenge yourself with the most weight, it's safer to go to the front than behind your head, where the shoulder muscles are in their weakest anatomical position. The standard rep range for hypertrophy is to use a weight that you can do for just 8-12 reps. While the muscle-building rep range is defined as 8-12 (going to failure using good form), your strength levels are higher when you begin your training session, so now's the time to push heavier loads. Instead of choosing a weight at which you fail at 8, instead opt for an even heavier one that you can do for about 6. The idea here is to train in a zone that's slightly more beneficial for building strength, which over the long run will help you add size. After warm-ups, do three working sets. If you have a training partner, do a couple of forced reps on your last two sets. Doing a second overhead press may seem redundant, but we're making a few important changes here: Instead of performing a press in which your elbows come somewhat forward, this one should push your elbows straight out to the sides, so your focus is now on the middle delts. I'd say go with dumbbells, which give you a slightly longer range of motion, but are also a little more difficult to control. You'll also be using a different relative intensity, meaning that instead of failing near 6 reps, you're going to use a load you can do for 10-12. The modifications, taken in sum, allow you to work the target musculature in a different fashion. Because you're doing two pressing movements to start this shoulder workout, limit the number of working sets to three apiece. If you're doing a second pressing motion, make sure it's done in a way that's unlike the first. Use different equipment, elbow position, and target rep ranges to achieve that. Consider cycling off two overhead presses in your routine on occasion to reduce the risk of shoulder or rotator-cuff injuries. Do 3 working sets for 10-12 reps.
Again, do a few forced reps of your 1-2 last sets to push past failure. Which deltoid head you target next depends on which is weakest. You'll start with that one, essentially prioritizing it when your strength levels are still fairly high. Over the course of your workout, fatigue begins to set in, so the last single-joint exercise you do probably won't get the same degree of effort as the first. If you determine your three delt heads are sufficiently balanced, you can rotate which head gets this position so that each one gets extra focus over your next three shoulder workouts. If you determine your three delt heads are sufficiently balanced, you can rotate which head gets this position so that each one gets extra focus over your next three shoulder workouts. Let's say you've decided that your rear (or posterior) delts are the most deficient, which is actually pretty common. So, you'll place a rear-delt exercise into this slot. When you bend over and bring your extended arms from a position below your body out to your sides, you hit the rear delts—an exercise called the bent-over lateral raise. Whether you're doing the movement standing (in the bent-over position), seated, or even on a pec-deck machine facing forward, the movement pattern is exactly the same. 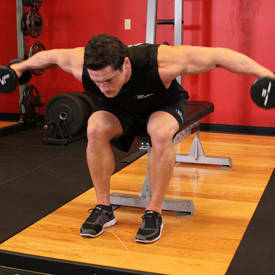 The bent-over lateral raise done with dumbbells is a fairly common rear-delt move. If you haven't been doing that one, it's the gold standard. But if you've been using the movement for a while, it's time to change things up. Choose a challenging movement rather than the easiest to perform (free weights are almost always harder than machines). If you're overusing a particular rear-delt exercise, it's time to include a few others in your workout, especially ones that are the most challenging. One key to ensuring the stress stays on the rear delt is to never extend your arm at the elbow as you complete the movement, a sure sign the triceps are kicking in. Your arms should be locked in the slightly bent position for the duration of the set. With single-joint movements, you should also use a slightly higher target rep range; with heavy weights for lower reps, the elbows take on a great deal of stress. Do 3 sets of 10-12 reps to failure. Do a dropset on your last set. Once you reach muscle failure, quickly reduce the load by about 25 percent and continue on to a second point of muscle failure. With dumbbells, you'll want to have your second pair nearby. This is where you want to start rotating the delt heads. If you hit your rear delts first, next up is your front or middle deltoid head. Again, order your exercises according to your weaknesses and target your strongest head last. Lateral-raise variations can be done seated or standing, one arm at a time or bilaterally, with one or two dumbbells at a time, with a cable that runs either in front of or behind your back, or even done when leaning away from the cable apparatus, which lengthens the range of motion. Let's assume you want to focus on the middle delt head here, to add more shoulder width. Raising your arms directly out to your sides targets the middle delts. Most likely your go-to middle-delt move is the standing dumbbell lateral raise, but if you've been doing that for a while, look for alternatives that provide a slightly different training stimulus. As with your first single-joint move, aim toward the high end of the hypertrophy range to reduce the stress on your elbow joint. Choose a version that's relatively unique for you, and a load you can do for 10-12 reps.
On your final set, do a dropset, reducing the weight by about 25 percent when you reach muscle failure before continuing on with your set. Check out CytoSport's complete supplement lineup! Go Now! With middle and rear delts accounted for, it's time to tend to your front (or anterior) delts. Mind you, the front delts won't always come last in your workout if you're rotating the order from one workout to the next. The front head is targeted when you raise your extended arms—elbows nearly locked, with a very slight break in them—directly in front of your body. This can be done standing or seated, with one arm at a time or both. 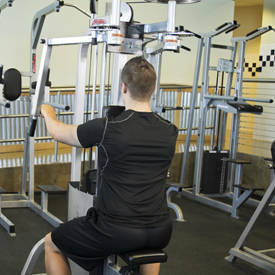 You can also use a variety of equipment types, including a barbell, dumbbells, cables, or a machine. Remember that your front delts also get worked in multijoint chest presses, especially incline movements, so they tend to be overdeveloped in guys who frequently train chest. As with the other single-joint exercises, do a version of the movement that isn't the one you've been relying on the most. One of my favorites is the cable rope front raise, in which your hands are in the neutral position grasping the ends of a rope attachment with the cable running through your legs. Doing 3 sets of 10-12 reps, with a dropset done on the last set, is your size recipe here. Not everyone has a target deltoid head they want to improve, but if you do, here's another place to address it: Include a second movement in your routine that specifically addresses your weakness. Since we identified the rear delts as a problem area earlier, let's take a look at how we can finish them off. Set your sights on 10-12 reps per set, and choose a machine or cable movement. Don't worry about choosing a "hard" exercise here. You want a movement that allows you to focus all your energy on simply moving the weight. Both the reverse pec deck and standing cable fly make good exercise choices here. 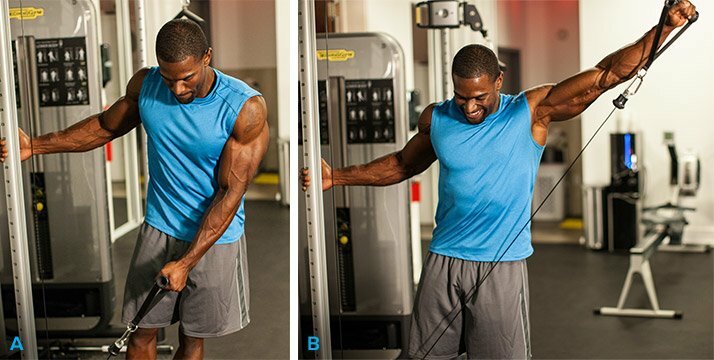 By moving the cables to their uppermost position, you can hit your rear delts from a slightly different angle than one in which your arms are about parallel to the floor. To deliver a maximum pump, do a dropset on all 3 sets. Choose a weight you can do for 10-12 reps and go to muscle failure, then quickly reduce the load by about 25 percent and continue on to a second point of muscle failure. This will ensure your weakness transforms into a strength down the road! Warm-up sets not included. Do as many as you need to, but never take warm-ups to muscle failure. On multijoint exercises 1-2, do forced reps with a training partner for a few additional reps past failure on your last 1-2 sets. On exercises 3-5, do a dropset on your final set. Exercise 6 is optional. If you're targeting a lagging head, do a dropset on all 3 sets. Rotate the order in which deltoid head comes first in exercises 3-5 to ensure balanced development.